We've all heard the song "The Twelve Days of Christmas," and we've all seen the traditional Christmas creche. Now, author Sam Beeson and photographers Nina and Terral Cochran combine these two classic Christmas icons to create A Rare Nativity. On the first night of Christmas I gave my enemy a briar from a tanglewood tree. On the second night of Christmas I gave my enemy two broken eggs. Night after night the "gifts" pile up - shards of glass, rusty nails, gnarled twigs, and more. What the narrator's enemy decides to do with each of these odious gifts is nothing less than a Christmas miracle. The photographic creation of the rare nativity at the end of the book is both a work of art and a wonder to behold. Forgiveness is something we all need to give and receive, and A Rare Nativity opens our eyes to the act of forgiveness and the true meaning of Christmas. It's a universal message to be shared with readers of all ages. Christmas is a season for giving. Make it a forgiving season. Sam Beeson gives himself annual writing assignments. In 2005, he wrote a poem a day. In 2007, he wrote about his wife every day. In 2015, each day he wrote a handwritten letter to someone new. Sam teaches high school English and loves reading the journals of his ancestors. This book is . . . well, a little different. It took a while of letting it settle in for me to appreciate it. Oh, I got the surface message right away, but it's just not the kind of book that comes out a grabs you from the first. The photos are not all that compelling (they aren't even color). The idea that these are gifts you give to your enemy makes it sound petty and childish. But these two things--the concept and the stark photos of trash--are the meaning of the book. I'm not going to tell you that meaning. I'm just going to tell you to dig a little deeper. Don't turn away from this book simply because you think you can't relate, because we all can. This message of forgiveness and the Atonement truly is "An unexpected twist to the 12 Days of Christmas." *I received a complimentary copy in exchange for my honest review. This book had me curious from the get go. Just the title alone caught my attention, although I had my doubts about it. Then, when I opened it and began to read, my doubts rose. I couldn't see how this book would pull together all the "gifts" that were given to an enemy into something beautiful. It surprised me and I was touched at the end and ashamed at my judgements. This book has a very poignant, sweet message on forgiveness. It is a great book that is for everyone of all ages, especially those have been or who have hurt someone. It is a beautiful way to look at forgiveness. This is a book that doesn't take long at all to read but the message will stay with you for a long time after that. For each of the twelve nights of Christmas, the author gives something to his enemy and, as you can imagine, they aren't great: broken eggs, old potatoes, shards of glass, rusty nails, etc. At the end of that, he's feeling satisfied with himself. Then, there's a knock at his door and a packaged gift from his enemy. As he opens it, he learns a powerful lesson about forgiveness and the true meaning of Christmas. The photos help convey the author's frustration with his enemy and what the enemy was able to make of those gifts at the end. I read this with my children and they enjoyed the message as well. This is a book we will read each Christmas for many years to come! When I started this book, I wondered what in the world I was reading. This is unlike any Twelve Days of Christmas version I've ever read. The book begins with the narrator giving his enemy trash-- a briar from a tanglewood tree, rusty nails, rotten eggs, etc. I wondered if this was meant to be a Halloween story or a joke, but then it all made sense. What this enemy chooses to do with this garbage is touching and heartwarming. This person truly exhibits a positive attitude and sees the world in a "glass half full" way. I was teary-eyed at the lesson learned and the outcome. What a great and touching story. There are many discussions that can be had with family (especially children) because of this book. Beautiful words, beautiful artwork, beautiful photography, and a beautiful message. 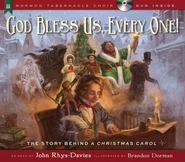 Great for anyone wanting to share the message of mercy and forgiveness at Christmastime. A new classic. Loved every page.